Among the significant cabinets featured in our June 2018 Baltimore Auction is the Beasley Collection, comprising an assortment of high-grade 19th- and 20th-century United States type coins, most of which are Gem or finer. Highlights from this collection include an MS-63 (PCGS) 1907 High Relief double eagle, an MS-62 (PCGS) Capped Bust Right half eagle, and complete sets of Indian Head cents and Peace silver dollars. Also offered as part of this impressive cabinet is a Gem 1874 trade dollar that ranks among the finest survivors of the issue. Certified MS-65 by PCGS, this trade dollar is encapsulated in an Old Green PCGS Holder and has been awarded a green sticker of approval by CAC. The obverse displays pearlescent lavender-grey patina, with tinges of golden, olive, and teal surrounding the devices. Paler ivory at the central reverse, contrasts with deeper olive and steel blue at the borders. Satiny luster is noted in the fields and surrounding the boldly pronounced devices that exhibit rich mint frosting. It is a beautiful example that displays truly exceptional preservation. 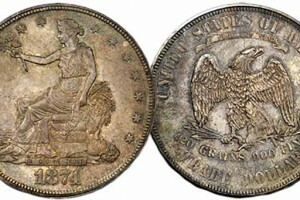 The 1874 trade dollar represents the second year of issue for this short-lived series. Despite its distance from the intended trade ports of Asia, the Philadelphia Mint still struck 987,100 examples, most of which eventually made it overseas to China. However, this mintage is dwarfed by the 2,549,000 examples struck by the San Francisco Mint in the same year. The 1874 issue saw heavy circulation as intended, and the majority of examples wound up melted in Asian furnaces or chopmarked and worn-down. Very few examples were spared from circulation, and the 1874 remains remarkably scarce in Mint State. In Gem condition, like the present example, it is rare with just a handful of specimens known. PCGS has certified only five coins at the MS-65 level and just three rank finer through MS-67. For advanced trade dollar specialists or Registry Set participants, the present offering is a significant opportunity. This MS-65 (PCGS) 1874 trade dollar from the Beasley Collection will be featured in our Official Auction of the Whitman Coin & Collectibles Summer Expo, to be held this June in Baltimore. Also offered will be rarities from other collections, including the Fairmont Collection and the Boston Old City Hall Collection. The sale will be available for viewing and bidding on our website www.StacksBowers.com, or you may contact our offices to secure a printed catalog. To speak with a numismatic representative today, please call 800-458-4646 or email Info@StacksBowers.com. Also, download our mobile app to view and participate in our exciting auctions via your Android or Apple device.